Compare Neato Botvac D5 Connected vs. Botvac D7 Connected: What Are The Differences? Neato is a robotics company located in California and considered to be one of the best and most popular manufacturer of vacuuming robots. Botvac D5 Connected and Botvac D7 Connected are the top two vacuuming robots the company makes, and the rich feature sets they come with will turn thorough and efficient cleaning of your home into an easy task. If you are considering to get one of these two Neato Botvac vacuuming robots, but you are undecided about which model to get, you may find this article useful: we will compare below in detail the features these two robots come with, so you may choose the most suitable one for your home's cleaning needs. Neato Botvac D5 and D7 Connected on Amazon. 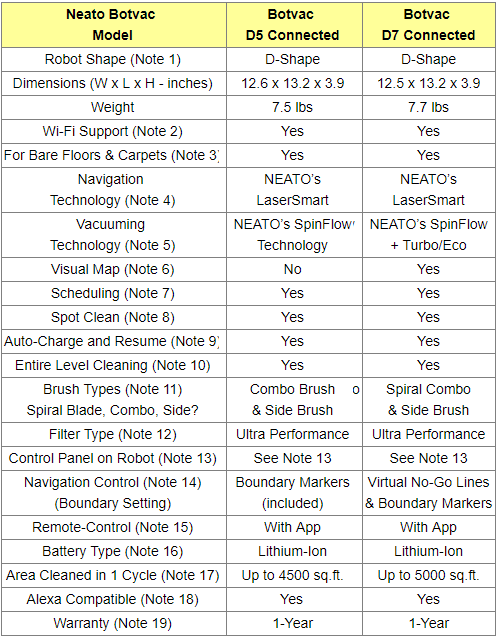 Otherwise, please continue reading below the detailed comparison of the Neato Botvac vacuuming robots. All Botvac series robots have a special D-shape with a rounded back and squared-off front. The rectangular front allows for a front-brush design and is better adapted to cleaning wall edges and corners. In addition, with a thickness of only 3.9 inches, Botvac robots are thinner than most other vacuuming robots, meaning that they can go better under low lying furniture. Botvac D5 Connected supports 2.4Ghz Wi-Fi. Botvac D7 Connected supports both 2.4GHz and 5Ghz Wi-Fi. You can use the Neato app for operations such as starting, stopping, scheduling the robot, spot cleaning and receiving notifications about your cleaning sessions. The Neato app is offered free both for Android and iOS devices. Both robots clean all floor types by automatically transitioning from one floor type to another, whether vacuuming on carpet or bare floors such as hardwood, tile or vinyl. With the LaserSmart technology, both robots are equipped with a laser eye that uses infrared light to scan the surroundings to build an accurate map of the room and any obstacles therein. Using this map, these robots are able to efficiently clean the floor in a pattern of straight and overlapping lines, avoiding obstacles and stairs, and never missing a spot. This method used by these robots makes sure that the entire floor surface is covered. Under normal operation, these robots will come off their charging dock, will scan the surroundings to build a map of the room taking into account of any obstacles and stairs that may be in the room, and will start cleaning in sections approximately 15 ft. by 15 ft., depending on room layout and furniture placement. They will continue to clean section by section until the entire area is cleaned. Normally, these robots will try to clean each room fully before moving on to the next. Note that if a room is only partially cleaned before the robot needs to go to recharge itself, it will come back after recharging to resume the job where it was interrupted. Neato's proprietary SpinFlow power clean technology combines potent suction with the combo brush to pick up not just dust, but more stuff that lands on the floor such as cereal, dust bunnies, crumbs, debris and fibers, to leave floors immaculate clean. Turbo and Eco are available on Botvac D7 Connected (not on Botvac D5): Eco mode provides a quieter, longer energy saving cleaning, while Turbo mode delivers a super-powered cleaning with maximum pickup. With Botvac D7 Connected, you are able to see on your smartphone or tablet a visual map of the space to be cleaned, and you can use the map to set virtual boundaries (called No-Go Lines) to prevent the robot from entering areas that are not supposed to be cleaned. You can also use the visual map to see floor coverage summaries. The visual map functionality is only available on Botvac D7 Connected. You can schedule both robots to automatically clean at a time convenient to you, up to 7 times a week (one cleaning for every day of the week).​Scheduling is done using the app from your smartphone or tablet. With both robots, spot clean is invoked either by pressing the "Start" button twice on the robot, or by using the app from your smartphone or tablet. With both robots, when the robot needs more power, it automatically returns to recharge, then returns by itself to where it left off and finishes the job. If no boundary markers are used at room entrances to prevent the robot from entering, these robots will clean one room after another until the entire level is cleaned. For information on boundary markers, please refer to Note 14 below. Botvac D5 Connected comes equipped with a combo brush which combines the cleaning power of blades and bristles and offers superior pickup of pet hair. It makes less noise during operation and is ideal for picking up hair from carpeted floors. Botvac D7 Connected comes with a spiral combo brush which is considered the gold standard for pet hair and dirt pick-up on floors of all types. Combined with Neato's powerful vacuum suction, it removes easily debris, dirt and fibers. It is effortless to remove and maintain, it generates reduced noise, and is the preferred brush solution for homes with different floor types. Both robots are also equipped with a side brush used for thorough edge cleaning. It allows the robot to get deep into corners and right up against walls as well as base boards for superior cleaning coverage. Both robots are equipped with an "ultra performance" filter that can capture twice the amount of allergens and dust captured by the high performance and standard filters used in the earlier Neato Botvac robot models. The filters are easy to change: just pop out and replace. These two robots are not equipped with a screen, and all functions can be invoked from your smartphone using the associated Neato app. They are simply equipped with a "Start" button to activate the robot and start a cleaning session. There are also a couple of LEDs that display robot and battery states. Note that with these two robots, you can initiate spot cleaning also by pressing the "Start" button twice. The following pictures show the top and bottom of these robots and the control buttons therein. To prevent the robot from entering off-limits areas, all Neato robots can use Boundary Markers made of magnetic strips. They simply block the robot from moving from one room or area to another. Easily cut, the magnetic strip can fit doorways, around pet bowls, cords, or anywhere you don’t want the robot to go. Both robots considered here come with a Boundary Marker roll included in the purchase. Additional Boundary Marker rolls can be bought separately if needed (see below Amazon products section). With Botvac D7 Connected, to prevent the robot from entering certain rooms or areas that are not supposed to be cleaned, you can also create Virtual Boundaries using the app and the visual map. With BOTVAC D7, these boundaries are called No-Go Lines. With both robots, you can use your smartphone or tablet to control the robot remotely. You just need to download the free Neato app to your smartphone or tablet and connect to the robot via Wi-Fi. Both robots come ​with a single rechargeable high capacity Lithium-Ion battery. ​When the batteries run low, these robots go back to docking base to recharge and then resume the cleaning where it was interrupted. Note that Lithium-Ion batteries provide longer run times than Ni-MH batteries, and they also last longer before needing to be replaced. Botvac D5 Connected: 90 minutes. Botvac D7 Connected: 120 minutes. Note that run times can vary extensively depending on the amount of work the robot has to do to clean the floors. That is because different types of carpets, different floor plans and different amounts of dirt may require different amounts of effort from the robot and hence different amounts of ''juice'' from the battery. One cleaning cycle includes 3 cleaning runs with 2 recharges of the battery. Note that the indicated square footage can vary based on floor type, room layout, furniture, etc. Both robots are compatible with Alexa, so they can be voice controlled. Just speak to Alexa and ask your Neato to start, and instantly hear it begin to clean. You can also control these four Wi-Fi supporting robots with Google Home, IFTT or Neato Chatbot for Facebook. There is also a Warranty of 6-months that applies to batteries. To see exact prices, please refer to the Amazon products section below. Note that the Amazon price often includes a discount on the list price. If a discount is available, it will be shown when you click the Amazon product links below. Botvac D7 Connected can be invoked to run in two different modes: Eco and Turbo. In Eco mode, which is the economy mode, the robot executes a longer and quieter clean, while in Turbo mode it delivers a super-powerful clean (50% more powerful than in Eco mode). With Botvac D7 Connected, you don't have to use Boundary Markers to prevent the robot from entering areas that are not supposed to be cleaned. Instead, you can simply set virtual boundaries called No-Go Lines using the app and the visual map of the space to be cleaned. You can also use the visual map to see floor coverage summaries. THe No-Go Lines feature is not available on Botvac D5 Connected. Botvac D5 Connected supports 2.4GHz Wi-Fi, while Botvac D7 Connected supports both 2.4GHz and 5Ghz Wi-Fi. When these robots are fully charged, D7 Connected can run longer than D5 Connected. In conclusion, Botvac D7 Connected is Neato's top robot, offering all the features you will need for easy, efficient and thorough cleaning of your home. However, if you don't need the additional features that come with D7 Connected, and you want to save some mony, you might want to consider Botvac D5 Connected. Please click the Neato robot of your choice below for price information or to purchase. Note that if some prices are not shown on the Amazon link images below, they will be provided once you click the images.